Published: Apr 12, 2018 · Modified: Apr 11, 2019 · By Jen Sobjack · This post may contain affiliate links. 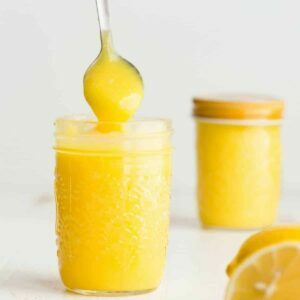 This Lemon Curd recipe is super-easy to make on the stovetop, it’s full of bright flavor, and it is perfect for cakes, cupcakes, crepes, spread on bagels and more! Happy Thursday! We are plowing right through spring with delicious lemon cupcakes and lemon blueberry bundt cake. I’m just all over the lemon flavor these days. Remember this lemon cream cheese frosting? I mean, I just can’t get enough of this bright, cheerful addition to spring desserts. I also love other citrus flavors around this time of year, especially lime pie! 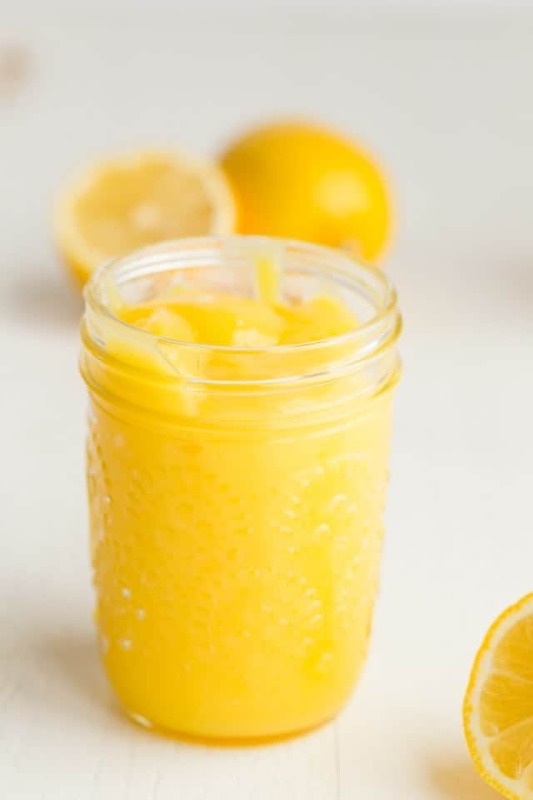 But, today is all about lemon once again. The weather is still wishy-washy. It can’t decide if it wants to rain or shine, be warm or cool. It just doesn’t know so I’m bringing my own sunshine in the form of lemon curd. I have yet to share a lemon curd recipe with you because I was waiting for THE ONE. The one with the perfect balance between sweet and tart. And the one that is practically no fail. 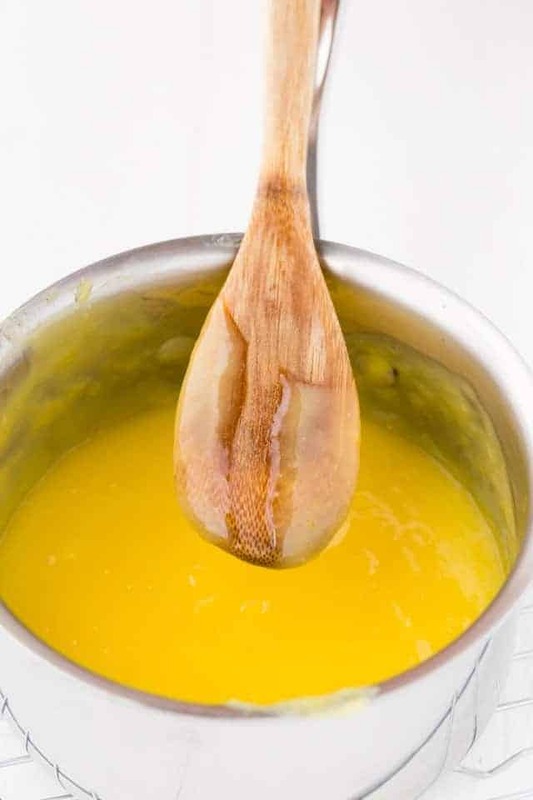 Just like my pineapple curd, this lemon curd gets cooked directly in the pot. This makes the process super easy. It’s so simple and is guaranteed to be a win for all your dessert needs. Heck, it’s even great as a spread on toast, English muffins, or bagels. 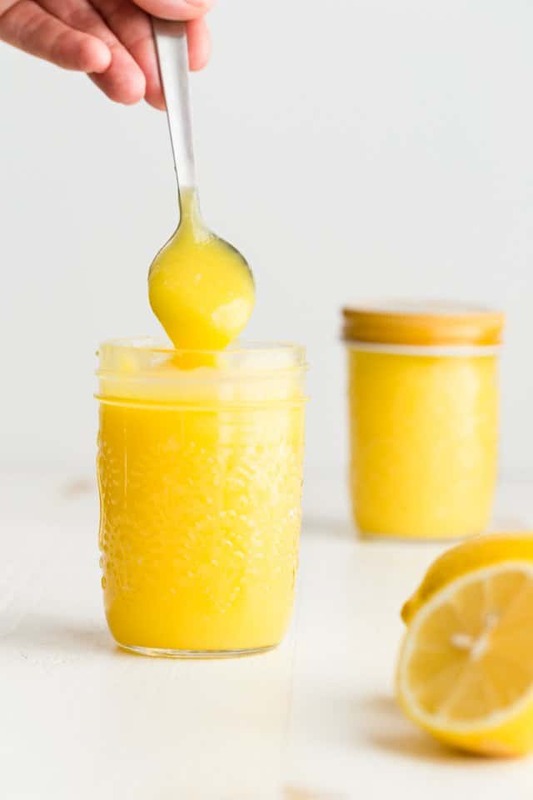 Lemon curd for breakfast? I’ll take it! Lemon curd is just like the filling in a lemon meringue pie. It’s tangy, sour, sweet, and creamy. This makes it perfect when paired with richer or sweeter elements like meringue. This recipe is one of the most basic of lemon curds. It calls for cornstarch and butter. While neither is essential, the butter softens the lemon’s sharp acidity and the cornstarch ensures the curd will thicken. Combine Ingredients: Add all the ingredients, minus the butter, to a stainless steel, heavy bottom pot. Give it a good whisk to combine it all. I like to use my handheld electric mixer here to make sure everything is well combined. Cook: Cook over medium heat and stir continuously as the curd cooks. It will start to thicken after about seven minutes. Add The Butter: Once the curd has thickened to the consistency of pudding, remove it from the heat and stir in the butter. Strain The Curd: Because the curd isn’t cooked in a double boiler, it’s possible you will end up with bits of scrambled egg. This is perfectly okay. Just strain the curd through a fine-mesh sieve to remove those unwanted egg pieces. 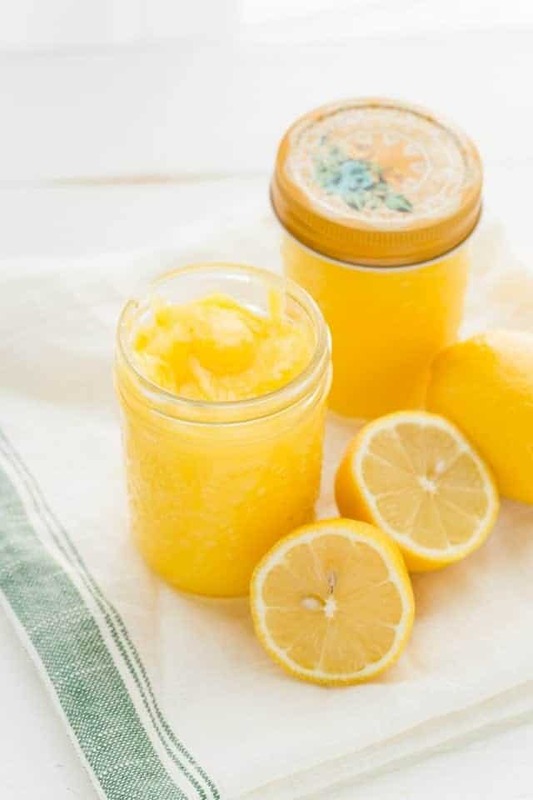 Cover and Refrigerate: Transfer the lemon curd to a bowl and cover it with plastic wrap. Make sure the plastic wrap is pressed right against the top of the curd to prevent a skin from forming on the surface. Refrigerate for two hours then serve. Lemon curd will keep for up to one week stored in the refrigerator. Use it to fill buttery jam biscuits or spread it over your English muffins. 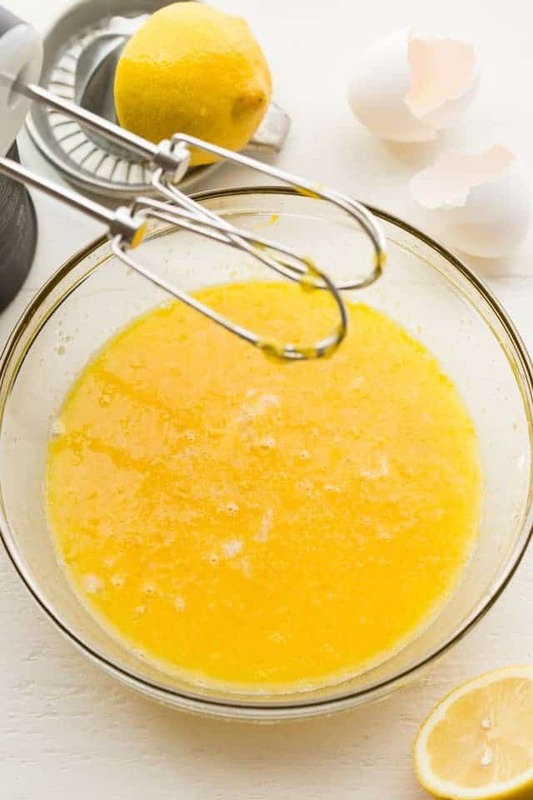 Add the eggs, egg yolks, lemon zest, lemon juice, sugar, and cornstarch in a large bowl. Whisk together until well combined and cornstarch is fully dissolved. Pour into a medium saucepan and cook over medium-low heat, stirring constantly with a wooden spoon, until thickened; about 7-10 minutes. You’ll know it’s ready when the curd coats the back of the spoon and is about the thickness of pudding. When the curd has thickened, immediately remove it from the heat and stir in the butter. Run the curd through a fine-mesh sieve to remove any bits of scrambled egg and transfer to a small bowl. Cover the bowl with plastic wrap making sure the wrap is touching the surface of the curd to prevent a skin from forming. Refrigerate for at least 2 hours or until set before serving. The curd can be stored in the refrigerator for up to 10 days. *The cornstarch and butter are completely optional! Cornstarch is used to ensure the curd thickens properly but it’s absolutely not necessary. It will thicken without it. Butter helps cut acidity from the lemon juice as well as keep the curd soft and spreadable.